What's New with Mountain Fall Vacations? New England Fall Foliage - "Must See's,"
New Hampshire Attraction Listing - Including "Must See's"
Check out the interesting Springfield Tavern & Restaurant located in the basement of the Historic Dobbin House built by Reverand Alexander Dobbin in 1776. The basement area where the Springfield Tavern is located once was a hidout for the "Underground Railroad" slave traffic. There are three small underground springs in the underground area - thus the origin of the Tavern / Restaurant name. Waiters are dressed in period garb, and we had fast and friendly service. A couple of fireplaces add to the atmosphere. Prices were reasonable, and the sandwiches we had were very good. Families with kids are welcome. Tip The Springfield Tavern is a very popular place for lunch, so reservations would help if you have a group, altho they are not required. Opens at 11:30 am. Fairly close to the National Park Service Visitors Center at 89 Steinwehr Avenue -- which is also Business Route 15 South. (717) 334-2100. A Top Pick Gettysburg Pennsylvania Restaurant. 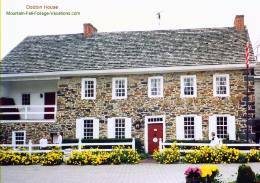 Dobbin House Web Site with History, Info, Directions, and Menus - no prices. Check out our Historic Gettysburg and Gettysburg Battlefield page for more information and pictures on the Gettysburg Battle Attractions. The Colonial Style Alexander Dobbin Dining Rooms are upstairs in the Historic Dobbin House -- there is a Gift Shop & "General Store" on the first floor where you can hang out and warm up your plastic while you wait for your table. The are six Dining rooms ranging from a Library to a Spinning Room and a Bedroom. Waiters are dressed in period garb and offer friendly service. Portions are generous, so save room for one of their great deserts. Reservations required. Opens at 5pm. This Gettysburg PA restaurant has won several dining awards. A Top Pick Gettysburg Pennsylvania Restaurant. The General Pickett's Buffet offers fairly wide selection of "All you can Eat" Buffett - Pennsylvania Dutch style food with something to please everyone in the family. Good food and very friendly service. Reasonable prices - a childrens menu helps out for families. Features fresh baked bread & homemade soups + salad bar. Wide selection of desserts & homemade pies. Pickett's gets high reviews from Individuals and Families on value and selection. Tip Check out the extensive display of Pennsylvania Covered Bridges Pictures on the walls. We discovered the head waiter was the photographer and knows a lot about local history -- maybe he still works there. 571 Steinwehr Ave, Gettysburg, PA - (717) 334-7580 - behind Gettysburg Battle Theatre - across from Cyclorama. To a Web page with more Info + Menues for the Gettysburg General Pickett's Buffet Restaurant - See the Home page for a location map Link. A Top Pick Gettysburg Pennsylvania Restaurant. We have always liked Friendly's Restaurants - whereever they are located - for Ice Cream and good food menu items of all kinds. Reasonable prices and their name is true to their good and usually prompt service - very friendly. They even have some specially priced menu items for the over 60 "Seasoned" crowd! To Web Page for National Friendly's Restaurants with Menu details (Including a great Ice Cream Desserts Page! - Gene's Favorite.) + a "Find a Friendly's" Address Map Link where you can see and print a detailed map of the Friendly's Gettysburg Pennsylvania Restaurant location. 445 Steinwehr Avenue - Gettysburg, PA - (717) 337-1426 - Another Gettysburg Pennsylvania Restaurant (& Ice Cream Desserts) Top Pick. A Gettysburg restaurant we had several good recommendations on, but that we did not actually get to try, is the "Gingerbread Man Casual Dining & Spirits" Restaurant / Tavern. Were told by several it had good food and very friendly service. The small dining area can be noisy, but apparently can ask to be seated at a quieter dining area upstairs. We will definately try the Gingerbread Man next trip to see if it should be included as a Gettysburg Pennsylvania Restaurant Top Pick. To Gingerbread Man Web Pages with description plus Menu Page with prices. Read candid user reviews and see 25 Gettysburg Area, Pennsylvania Hotels & Resorts Ranked by User popularity with comparison pricing and pictures at: Compare prices and read what other travelers have to say at TripAdvisor for Gettysburg, PA Hotels & Vacation Condo Rentals. Click the Green "B&Bs/Inns" tab on page for 17 area Bed & Breakfast / Inn listings with User Ratings and Comparison prices. Historic Gettysburg Battle & Nearby Battleground Attractions Trip + Gettysburg Cemetery - Including return through Pennsylvania Dutch Country and Amish Farm areas. New England Fall Foliage Picture Album - Screensavers / Wallpapers page - approximately 5 x 7 size free downloadable and printable versions of some New England Fall Foliage pictures. Historic New Hampshire Mt Washington Hotel - New Hampshire Vacation Resort Rentals Option - nearby area Fall Foliage Vacation Scenic Day Trips, NH Fall Foliage Attractions and Colorful White Mountain Fall Foliage Viewing Drives. Mountain Fall Foliage Vacations Home Page - Affordable New England Fall Foliage Vacations - Including Pennsylvania Pocono Mountain Vacations and New Hampshire Fall Foliage Vacations. Thanks for dropping by -- come back and visit us soon for Info on your next Affordable Gettysburg Pennsylvania restaurant "reviews" or Gettysburg, PA Area "Must See's." Please send us any Comments or Suggestions you might have for this Mountain Fall Foliage Vacations Site to us on our Comments, Suggestion, & Favorites Form. If you have any personal Gettysburg Pennsylvania Restaurant Favorites you would like to share, please send them using our Comments & Fall Vacation Favorites Form. To Mountain Fall Foliage Vacations Home Page - Affordable New England Fall Foliage Vacations - Including Pennsylvania Pocono Mountain Vacations, Maine Fall Foliage Vacations (to come), and New Hampshire Fall Foliage Vacations + New England Attraction "Reviews." To Top of this page - Gettysburg Pennsylvania Restaurant Top Picks - Reviews and Tips. Gettysburg PA Restaurant Favorites.